Have you checked out the Bo Bunny Mini Albums? They are so terrific! The different shapes of them make them so fun and I LOVE that they are ready to decorate!! 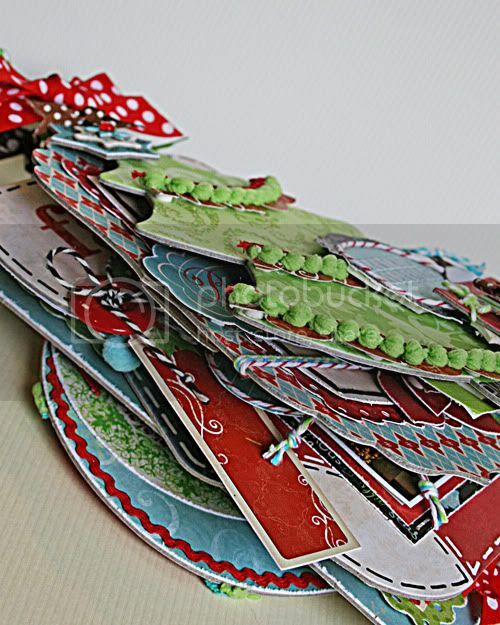 Isn't it great to start with perfectly coordinated minis that are ready to decorate? 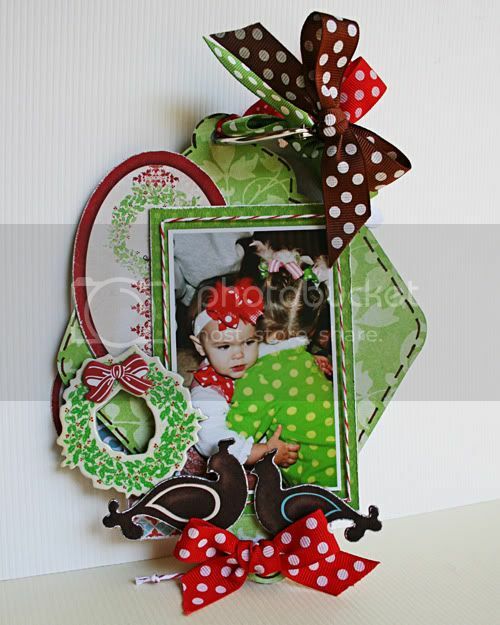 I chose to use the Blitzen Album for these precious pictures of a trip to Santa's Wonderland. There are a lot of pages in this mini, so I didn't do close-ups. I'll be sharing some tips after each of the pages though, so just keep scrolling along. 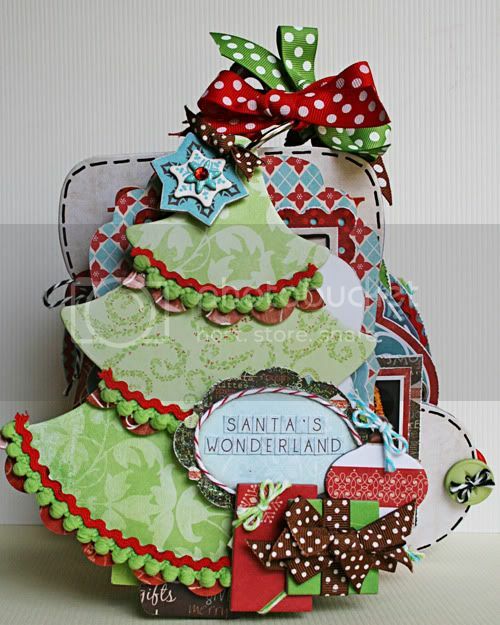 To make the scalloped border stickers follow the curve of the tree, I just used powder to get rid of the sticky backing and then gave a little pinch in the center of each scallop. Attaching ric rac and trim is easy when you use the right glue! Use Fabri-Tac by Beacon to attach. It dries clear and it dries fast! You can see from this picture that there are a LOT of things going on with this album. Sometimes, using a lot of layers, trims, bows and pop dots can make your album a bit difficult to handle and turn correctly. If that is the case, the fix is simple! Just get a larger ring to use at the top. To get the nice white outline on this page, I first used a white Souffle Pen and then added a thin line of glitter glue right over the top. Use foam dots to get the layers on the flower. I cut and extra flower to give myself 3 layers. 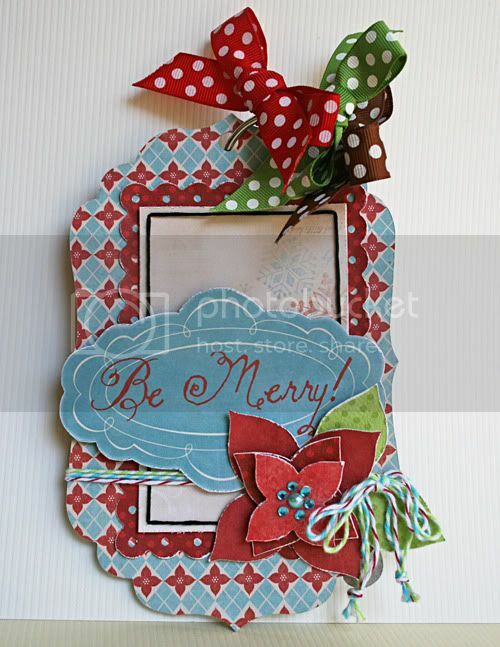 The poinsettias are included in the awesome Noteworthy package. I only put in four holes, one at each corner, for the black floss border. Just use tape on the back to keep everything flat. Think about layering similar images. 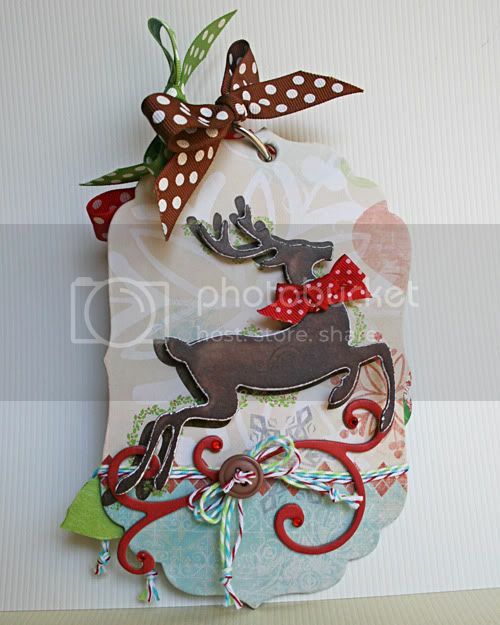 I really liked how adding the chipboard reindeer using foam dots added interest to this page. 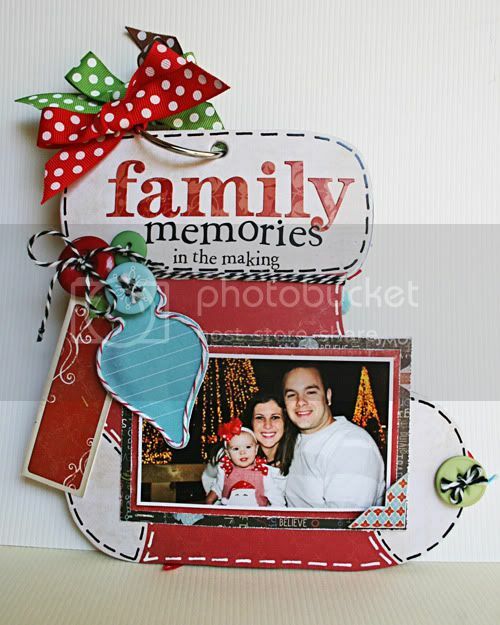 Using foam dots also allowed me to layer the twine and flourish chipboard more easily. Use Souflee and Glaze pens to draw on stitches. 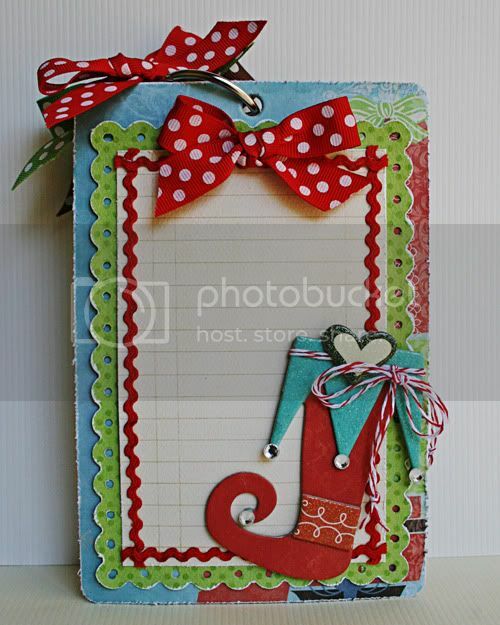 I also backe the large tag with patterned paper, so it would look nice when you flip to the next page. Mix up letter stickers with rub-ons to easily tell the story. To make the Blitzen letter stickers show better on the striped background, I stuck them to some lightly inked chipboard letter stickers from the Et Cetera collection. The fonts are the same, but the size is a bit different so it worked perfectly. The die cut is from the Noteworthy. Because it is the same on both sides, I just folded it in half so that the other side would look nice, too! I made a hole through the album page to attach the brad. You will see on the other side that I cover the hole with a bow. You can see the Noteworthy behind the wreath and see how the bow covers up the hole and the prongs on the brad. To attach the twine, just pull up on the heart part of the layered chipboard, tie the twine and use a touch of glue to secure the heart back in place. Why not use lots of different alphabets to tell part of the story? I used Blitzen and Welcome Home stickers. I also used Blitzen Rub-ons and a couple of misc. rub-ons, too. Tie on little extras to the bottoms of bows. 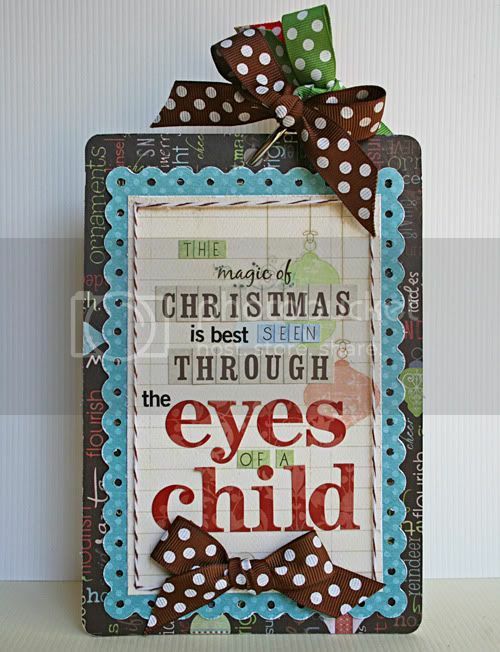 Here I used a little Christmas heart and in other places, I used jingle bells. Don't forget to finish it off! 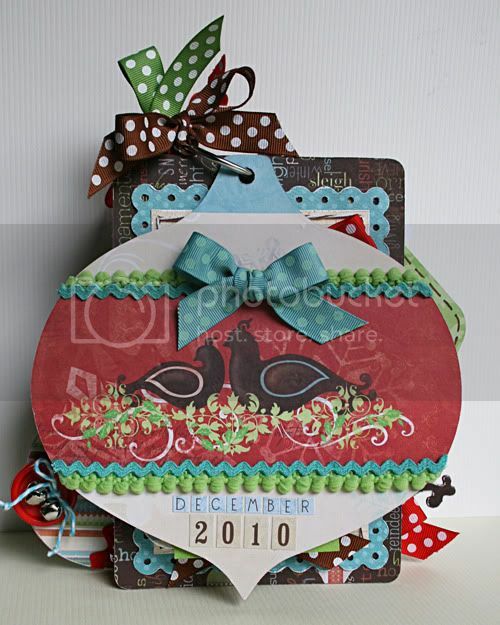 For the backside, I just used a bit more trim and ribbon and added the date. It's a nice way to add the date or any other little details that you might not have put inside. Other Supplies: Baker's Twine, Jingle Bells, Ric Rac, Pom Pom Trim, Misc. Word Rub-ons. We always love to she what your are doing with Bo Bunny! Sorry I have to use the same word.....ADORABLE. Robbie, this is absolutely gorgeous! I can tell you spent so much time on this sweet album! I love all your different layers ,and the photos are so cute! Thank you for the inspiration!!! I'll be number 3..... ADORABLE!!!!! Oh my, this is totally gorgeous and so adorable too, Robbie! 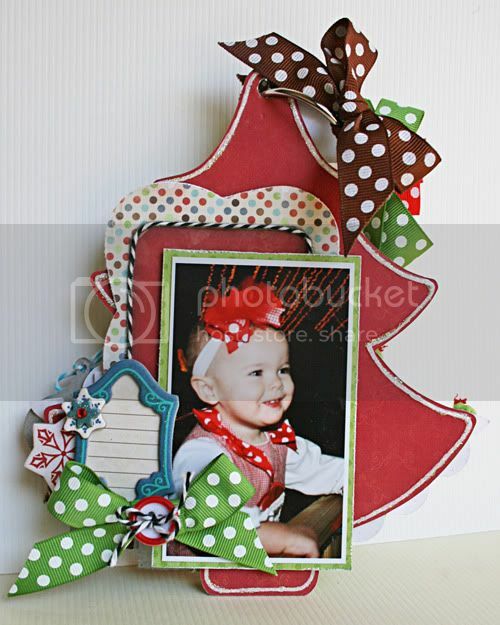 I just love the red polka dot ribbon, which matches so perfectly with her bow and dress. just beautiful! i would LOVE to know how the paper is placed on the shape!! Well I think I will add "ADORABLE" too. Because it really is. This album is just so cute! 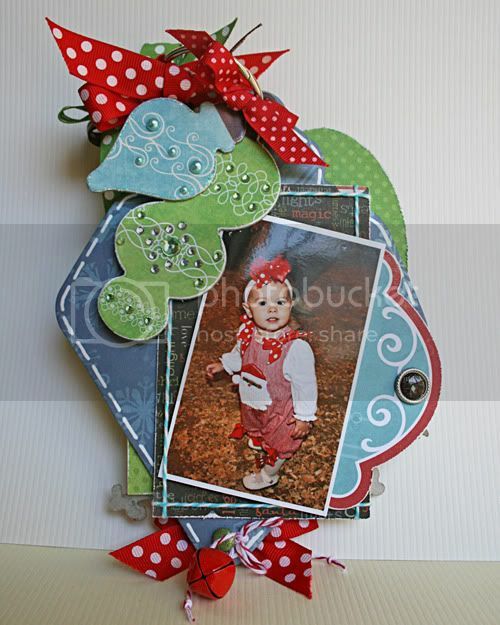 Love the shapes and the pps here, and of course, those cute cute photos! Great mini book. I love to make these. Always endless possibilities, and lots of fun. The "Blitzen" line would be great to work with. This album is so cute. Love that every page is different.